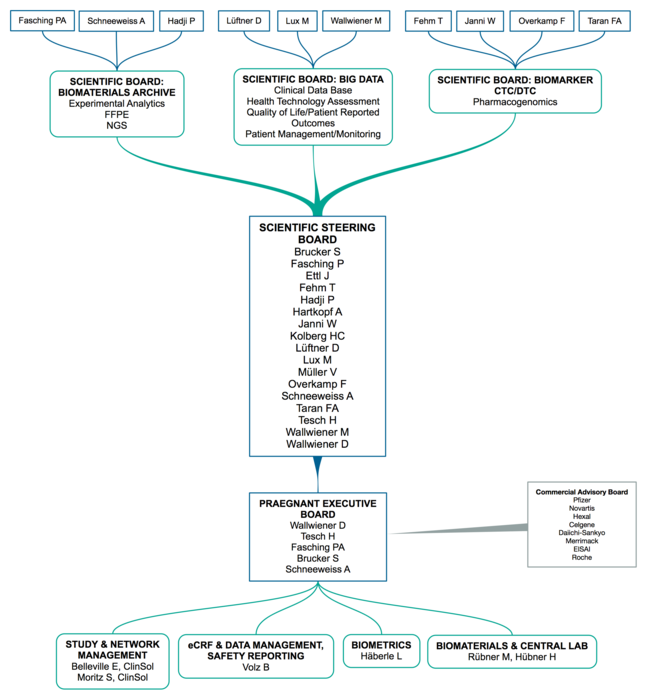 PRAEGNANT - Prospective Academic translational research network for the optimization of oncological health care quality in the advanced setting. 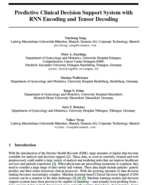 This german study network was set up to take account of some of the recent developments in molecular medicine in the treatment of patients with metastatic breast cancer. PRAEGNANT is subdivided into three main phases. In phase I, only advanced breast cancer patients are included. In phases II and III the data base should be expanded by (neo-)adjuvant breast cancer patients and in the end by other tumor entities. 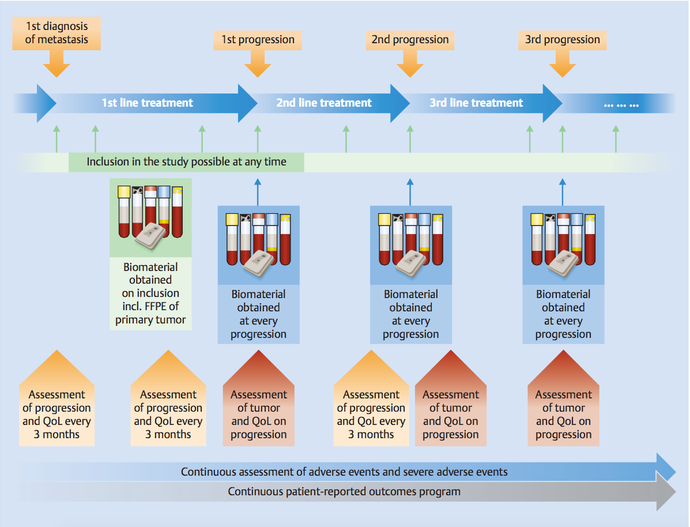 The protocol was amended and updated in March 2019 reaching Phase II to enroll patients with the diagnosis of early breast cancer in the neoadjuvant or adjuvant curative treatment setting. If you are interested to take part in the study. Please don´t hesitate to contact a study center in your vicinity. Your personal biomarker profile will be given to your treating phyisician, if you wish so. Then your treatment may be changed or you can be introduced in other clinical studies which show a good prognosis according to your biomarker profile. All treatements and collected data will be treated confidentially. Mutation analysis of putatively clinically relevant genes within cfDNA of PRAEGNANT study participants Burwinkel et al. Thyroid Dysfunction in Metastasized Breast Cancer - Prevalence and Clinical Impact Heublein et al. Incidence and impact of Cytomegalovirus (CMV) infections in patients with metastatic breast cancer (MBC) and brain metastases (BM) within the PRAEGNANT network. Müller et al. Quality of Life Assessment in Breast Cancer Patients with Brain Metastases Müller et al. Companion diagnostics for aromatase inhibitor treatment using the estrogen receptor pathway Müller et al. Frequency of high and moderate penetrance germline mutations in breast cancer susceptibility genes in leukocyte DNA and circulating free (cf) nucleic acids. Fasching PA, Couch FJ et al. Was ist das PREAGNANT Netzwerk? Im Zeitalter der molekularen und genomischen Analysen müssen wir nach Wegen suchen, wie wir Patientinnen, Ärzte und Wissenschaftler miteinander vernetzten. Dies soll nicht nur die Wissenschaft fördern, sondern sollen einen direkten Nutzen für ‎Patientinnen und Ärzte mit sich bringen. Im Prinzip kann man sich PRAEGNANT wie eine zentrale Verwaltungsstelle für alle Biomaterialien und Patientinnendaten, natürlich anonymisiert. Welchen Vorteil hat es, dass die Biomaterialien und Patientinnendaten zentral gesammelt werden? Das PRAEGNANT Netzwerk besteht aus vielen teilnehmenden Zentren und einer Gruppe von Brustkrebs-Experten, die als Steering-Board zusammen mit Wissenschaftlern überlegen, wie neue, molekulare Erkenntnisse genutzt werden können, um mit neuen Methoden und neuartigen Studien Vorteile für die Behandlung von Patientinnen mit einer fortgeschrittenen Brustkrebserkrankung erreichen zu können. Gibt es nun zum Beispiel eine Studie, bei der ein molekularer Marker hilft, die Patientinnen zu identifizieren, können diese zentral und damit kostengünstig für das gesamte Patientinnenkollektiv untersucht werden. Ein Beispiel sind BRCA Mutationstestungen für die PARP-Inhibitorstudien in der metastasierten Situation (EMBRACA und ABRAZO). Was muss die einzelne Patientin beitragen? Die Patientin wird durch ihren Arzt über die Studienteilnahme aufgeklärt. Wichtig ist, dass die Patientin einverstanden ist, dass ihr Arzt mit ihr über den weiteren Krankheitsverlauf und die weiteren Therapie in Kontakt bleiben darf. Bei Studieneinschluss und bei jedem Therapiewechsel werden 5 Blutproben in die zentrale Biobank geschickt. Des Weiteren werden Tumorproben, soweit vorhanden, angefordert. Selbstverständlich wird das Tumorgewebe nicht aufgebraucht und nach der Isolation von DNA und RNA an den jeweiligen Pathologen zurückgeschickt. Aktiv wird die Patientin gebeten, dass sie alle 3 Monate Fragebogen ausfüllt, die die Lebensqualität, Ernährung und die körperliche Aktivität dokumentieren. Wie viel Zeit muss die Patientin mitbringen? Außer der Blutabnahme und den Fragebögen gibt es keine Verpflichtungen, die zusätzlich zur Routinebehandlung durchgeführt werden. Das Ausfüllen der Fragebögen dauert ca. 20 Minuten. Wo kann sich die Patientin anmelden? Entstehen hierdurch Kosten für die Patientin oder die teilnehmenden Zentren? In der Studie muss natürlich eine Infrastruktur zur Dokumentation und zur Biomaterialsammlung zur Verfügung gestellt werden. Diese ist gewährleistet. Für Tests, die an den Biomaterialien durchgeführt werden müssen die Kosten für diese Tests erst über öffentliche, private oder industrielle Partner gedeckt werden, bevor eine Testung stattfinden kann. Kosten für die Patientinnen entstehen nicht. Was sind die langfristigen Ziele des PRAEGNANT-Netzwerkes? Die Herausforderungen an alle Beteiligten, molekulare Medizin verständlich in die Krankenversorgung zu integrieren sind enorm. Das wichtigste Ziel ist es deswegen, nicht nur molekulare Medizin für die Patientinnen verfügbar zu machen, sondern Patientinnen, Ärzte und weitere Beteiligte "fit" für diese Zukunft zu bekommen und eine schnellstmögliche Umsetzung von Therapie-Chancen in und außerhalb von Studien zu ermöglichen. Fasching PA et al. Biomarkers in Patients with Metastatic Breast Cancer and the PRAEGNANT Study Network. Geburtshilfe Frauenheilkd. 2015 Jan;75(1):41-50. Hein A et al. 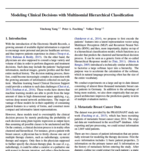 Computerized patient identification for the EMBRACA clinical trial using real-time data from the PRAEGNANT network for metastatic breast cancer patients. Breast Cancer Res Treat. 2016 Jul;158(1):59-65. Fremd C et al. Use of complementary and integrative medicine among German breast cancer patients: predictors and implications for patient care within the PRAEGNANT study network. Arch Gynecol Obstet. 2017 May;295(5):1239-1245. Hartkopf AD et al. Treatment landscape of advanced breast cancer patients with hormone receptor positive HER2 negative tumors – Data from the German PRAEGNANT breast cancer registry. Breast. 2018 Feb;37:42-51. Müller V et al. Impact of disease progression on health-related quality of life in patients with metastatic breast cancer in the PRAEGNANT breast cancer registry. Breast. 2018 Feb;37:154-160. There are different factors which influence the prognosis and possible treatment side-effects. Few of them could have a prognostic significance for patients with metastatic breast cancer, even if they are not yet used much in routine clinical practice. An additional aim is to take blood samples, as a kind of „liquid biopsies“ after each therapy change, to track the possible change of the tumor characteristics. 1) Fasching et al: Biomarkers in Patients with Metastatic Breast Cancer and the PRAEGNANT Study Network. Genetic factors comprise germline and somatic mutations as well as structural and numerical genetic alterations. 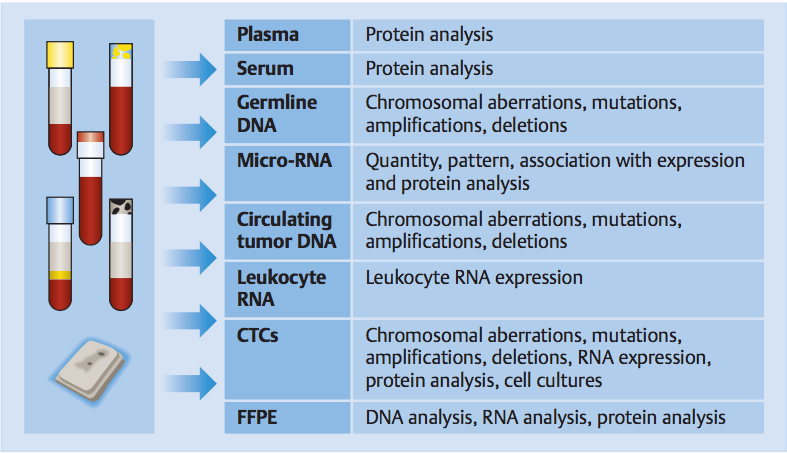 These result in changes gene and/or protein expressions and are associated with tumor biology and prognosis. Therefore they may be utilized as prognositc biomarkers for prognostic evaluation of therapy planning. The presence of CTCs in plasma has been consistently associated with prognosis in patients with breast cancer – non-metastatic and metastatic. A second approach shown to be very promising ist he profiling and genotyping of cirulating tumor DNA (ctDNA). The change of ctDNA genotypes may provide an early indication about efficacy and treatment response. Blood sample of each patient will be taken at the beginning of the study and after each change of therapy. Here you can find any paper, posters and synopses to download.